The first time I made a family tree was for a primary school project; I do not recall exactly how old I was. During those days genealogical information was hard to come by and the trees presented by most students in the class were somewhat limited. My tree was one of the few going back furthest in time, all the way back to the birth of my paternal Great-Grandfather. I did not have to do much research to get the data at the time; my Great-Grandfather was still alive. A few years later, well after my Great-Grandfather passed away at the ripe old age of 96, we found a few documents he left behind for my Grandfather. These included a few black and white photographs of people nobody in my extended family could identify and a note detailing the family history. The note had names we could not decipher; and, honestly, we weren’t all that sure if they were names at all. Therefore my Great-Grandfather’s note found its way into a cabinet drawer for quite some time. Fast forward a few years — family tree software start being available; genealogical databases start appearing online; and, through the advent of email, we reconnected with very distant family members. We knew that these members of the extended family were related to us but nobody seemed to remember how exactly. Some of these distant relatives explained to us of their relationship to the first Ger Rabbi and names like Hidushei Harim and Sfat Emet, names that appeared on my Great-Grandfather’s list, start popping up in conversations. 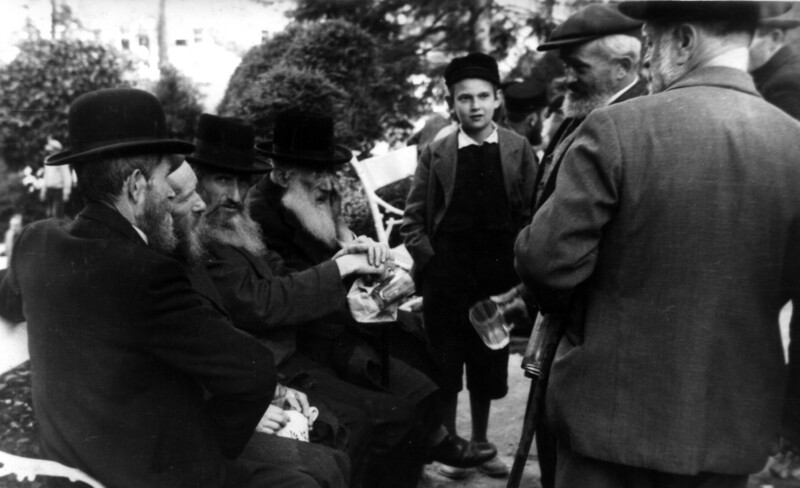 These distant relatives mentioned that they knew of my Great-Grandfather and that, even though he was not an orthodox Jew, they remembered he attended many ultra-orthodox Hasidic weddings and events, back in Poland and in Israel. People knew he was related to the Ger dynasty somehow but nobody seemed to know how exactly. We rushed back to that note in the cabinet drawer and things started making a bit more sense. The list outlined the relationship between my Great-Grandfather and the Ger dynasty; However, according to the Yihus trees we were presented by our distant relatives it appeared the my Great-Grandfather’s list was all wrong. And so back to the drawer it went. A picture found in an old drawer. Location unknown. A few years and one devout genealogist later, a different picture started to emerge. With the help of one tireless genealogist (who later turned out to be a distant cousin), and with the records of JRI Poland, we slowly started to find out that the list actually had merit and matched very accurately actual Polish documents on file — birth, marriage, and death certificates. While cross-checking these records, parts of the list were verified to be correct even though it contradicted some of the Yihus trees that we were presented, but in some cases also created some gaps that were yet to be filled. We slowly began piecing together a tree, or more accurately a rather large branch. We’ll call it the Silesian Branch since most of the individuals in this branch lived in and around Katowice, in modern day Polish Silesia. I’m a great-grandson of David Rotenberg son of Yeshaya, son of Shraga Faivel. Today in Israel, Jerusalem. I will like to get more details about my family, and pictures. I emailed you with some more details. Greetings! Thanks for the great detail of your site. It has helped me fill in some blanks on some of my distant family. I do have a question, though. Many of my earlier Rotenbergs have a v.(vel) Spiewak attached to the name. I was given to understand that at some point, the family, for whatever reason, chose to change their surname, presumably from Spiewak to Rotenberg. I believe you will see this on JRI-Poland. As far as I recall those names on JRI-Poland mention both Rotenberg and Spiewak. Spiewak is Yiddish for Cantor. Therefore it could also mean that the specific Rotenberg mentioned was a cantor. However, at this point I don’t think there is enough data to make a verdict. Also if you have any added information I would be happy to hear more from you.